I always enjoy reading monthly favourite blog posts but I feel like writing them requires a certain level of organisation that I don't have. By the time I even think about writing a monthly favourites post, it is already half way into the next month. Also I am a creature of habit and tend to stick to the same products that I have been using since I was a preteen. So, instead of writing a monthly favourites post, I decided to write a post about all the random things that I have been enjoying lately - and I even managed to pick some things that aren't edible which is even more surprising. 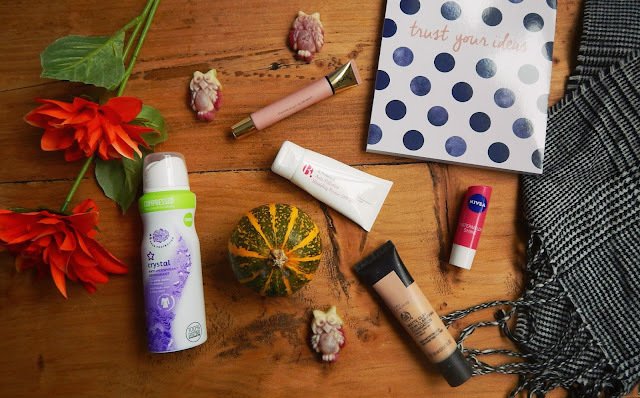 Some of you may remember that a little while ago I wrote a post about making ethical consumer choices and how I wanted to start by swapping my go-to beauty products for cruelty free options. My foundation was one of the first things that I was keen to explore other options with as I had been repurchasing the same product for years so I was definitely ready for a change. I liked the matte finish of this foundation especially as it didn't appear cakey on my skin as many matte foundations do. It is a good medium coverage and blended really nicely. Also, as a pale girl, I was really excited that they had some good light shades and there were even shades for people with lighter skin than mine which is a revelation as I usually just have to go with the lightest shade and still end up looking orange. I started using this primer a few months ago because, admittedly, I misread the price and thought I was getting a really good deal (tip: make sure you are reading the price for the product you want to buy and not the one next to it on the shelf). Because I am a massively awkward person, I begrudgingly paid for this primer. Happily though, this primer actually turned out to be really good. I love the consistency as it is quite thick so you really feel like it is a creating a good base for your foundation. I haven't had issues with caking that I constantly used to get since I switched to this primer and, despite being a thicker formula than the products I was used to, it doesn't feel heavy on your skin. It blends well and creates a really nice base. I think I will even repurchase this product - on purpose this time! This is a product that I have been repurchasing for years and I had completely forgotten about until I found it sitting around in the back of my drawer. I love the watermelon scent of this lip balm and it gives a slight pinky-red finish to the lip but it is quite subtle which is what I look for in a lip colour. It is not intensely moisturising but a good product to use regularly as I find that products like Vaseline are overly moisturising on my lips and then my lips start getting chapped when I am not using them. This product has been an absolute treat for me as I am very much someone who uses high street makeup products. My auntie very kindly bought me this when we went shopping together and I was beyond excited to use it. I loved the pink colour as I feel like it really complements my skin tone and the shine is glorious. I am still learning how best to apply this though as I am not used to using a highlighter that isn't a powder. Back on the cruelty free side of things, I recently tried out this deodorant and I was really impressed with it. I usually stick to brands like Sure but I haven't even noticed any difference since switching to this cheaper version - which is definitely a good thing. Why spend more on a non-cruelty free item when you can get just as good results with this? This is a bit of a random one but I have been loving picking up some little bits and pieces for bubba from Scope. Of course their stock totally depends on donations but I always seem to find things that are in good condition and are reasonably priced in their shops. One great thing about having moved to London is that the Poundlands are much bigger here - thrilling, I know. I recently picked up the flowers and the notebook you see in the picture from Poundland and I find that they are the absolute best for cheap blog pic props and you can afford to change your props more regularly as it is just so affordable. Also their Halloween stuff is second to none. I picked this scarf up from New Look because I was pretty unprepared for the temperature drop that has hit the UK recently and I felt like the blood in my veins was slowly turning to the consistency of a cherry Slush Puppy. I was impressed by the price and the cosiness but also because it was giving me Hannah Gale vibes and she is an absolute icon so it had to be purchased. I may have mentioned my newfound love for Greenwich Market in my blog post about moving to London but I wanted to include it here as well. I am a huge market fan and have always loved going to places like Borough Market and Camden Market. Heck, even church fetes and jumble sales. If it has stalls, I am there. So, when I discovered Greenwich Market right on our doorstep, I was so excited and I have been there a fair few times already. I mean, there are some really good food stalls there and I am a hungry person with a lot of time of their hands.